I hope everyone out there is keeping up with what’s happening over at Mr. Completely’s Gun Blogger Rendezvous page. Mr. C has posted this year’s schedule, including the newly added bowling ball mortar event! He’s also posted a list of sponsors which, looks pretty impressive. If you’ve been to the rendezvous in years past, you know there has been some pretty good swag lately, and this year is no exception. I already know that True Blue Sam is donating a Ruger Blackhawk to this year’s raffle. If I get my tail in gear it will be clothed in a nice custom holster rig. Also, I’m pleased to announce yet another firearm will be joining the raffle. Back around 1900 Stevens was very well known for making an assortment of ‘boys rifles.’ Unlike today, teaching a child to shoot was the norm in most places and being able to give a child a rifle would ensure many hours of entertainment, and maybe even a critter or two to put on the table. 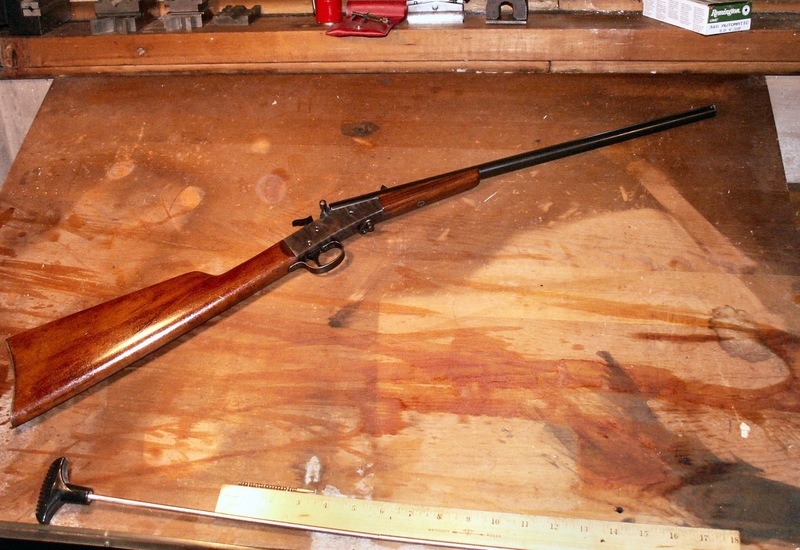 Stevens targeted this market by making a string of single shot rifles in small sizes. They were mostly simple construction with colorful names like “Sure Shot” “Crack Shot” “Maynard Junior” and “Little Krag.” Around 1906 they introduced a model they called the “Little Scout 14.” It was a rolling block action that was operated by a simple thumb stud on the side of the block. 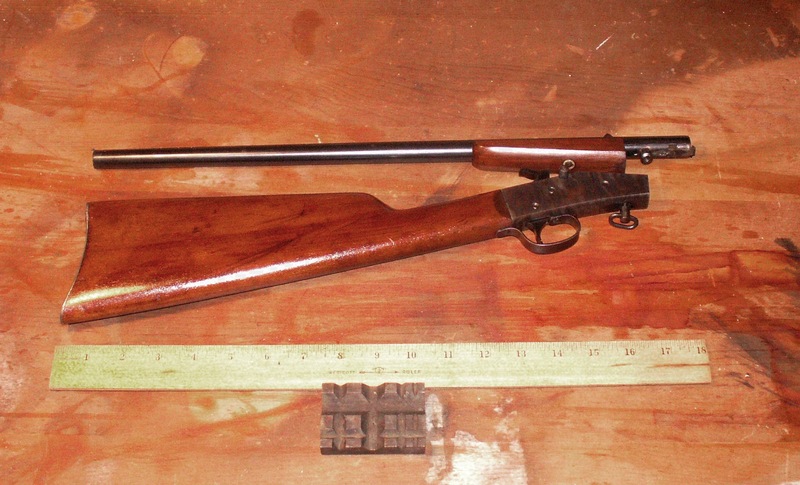 This model had a single piece stock that enclosed the receiver. 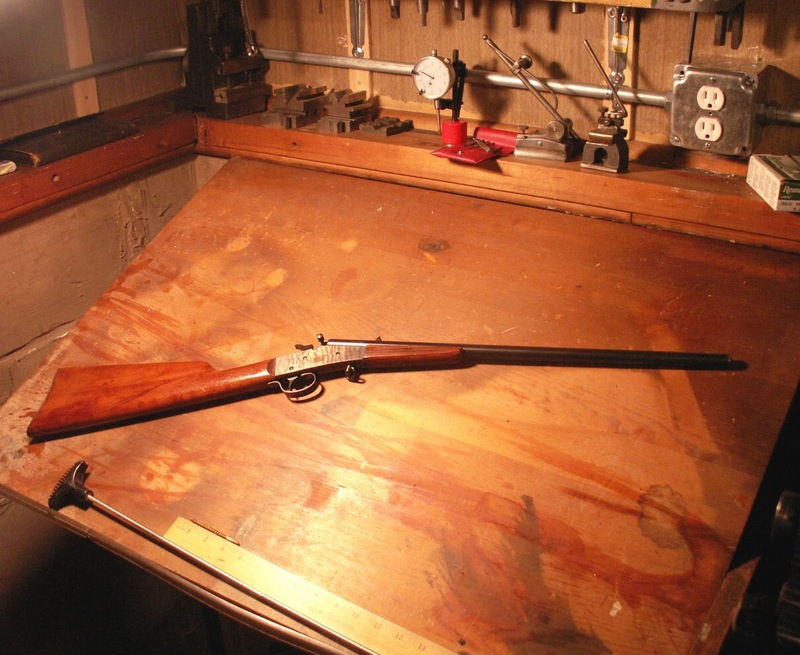 This was made for a relatively short time before Stevens redesigned the rifle with a two piece stock, making it a very simple and compact takedown rifle. The new model was dubbed the “Little Scout 14 ½” and produced from about 1911 through the WW 2 (Dates vary according to source) When I ran across this I wasn’t all that enthused at first. These rifles were intentionally made to be as simple as possible and the outward condition of this one didn’t look too good from the pictures I first saw. Then the seller said “I was thinking about polishing it up and rebluing it, the old bluing has funny streaks running through it.” I winced a bit and struck a deal on the condition that he NOT try to clean it up before I could check it out. 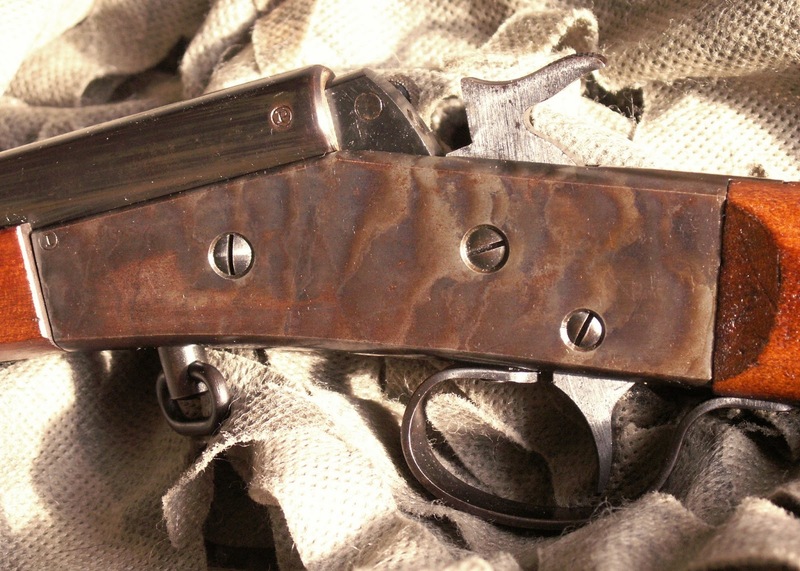 You see when Stevens switched to two piece stock with the exposed receiver, they didn’t use any bluing techniques on the receiver, they color case hardened it, a process in which you heat the steel in a carbon rich, oxygen starved environment and then immediately quench in water. It creates unique color combinations depending upon the carbon source and the minerals you have dissolved in the water. When I got my hands on the rifle it was not particularly pretty. 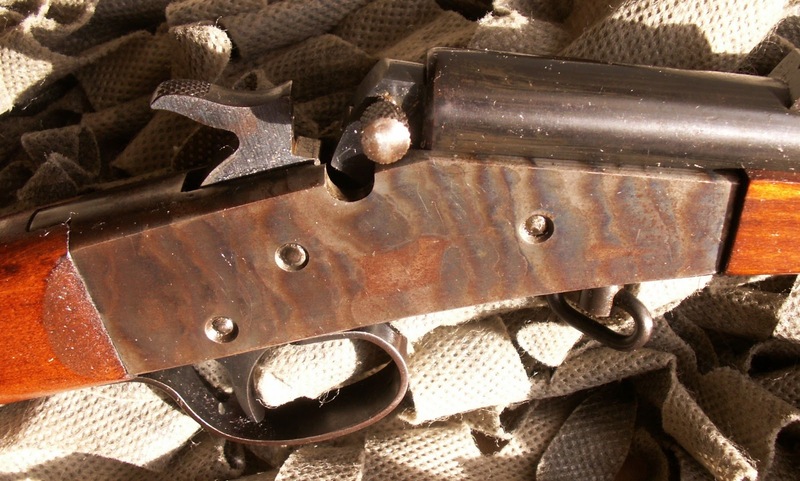 The receiver looked very dull, but you could see the case hardening hiding under a thin layer of oxidation so I disassembled the rifle slathered the receiver with heavy oil then carefully went to work with #0000 steel wool, craft paper, and a copper penny. After a couple hours I was satisfied that I had removed most of the corrosion (better to polish too little than too much) so I wiped it down. It looked good, and I was happy, but then I took it out into the sunlight. Wow, in daylight the colors just light up and make this a really pretty rifle! There’s a little bit of oxidation still left on there, but the colors are still bright and more importantly it looks ‘right’ for an old rifle. With a light coat of oil this can stay looking pretty for a long time to come. The bore has a little bit of corrosion in spots, but the rifling is still good, so as long as you give it a good cleaning from time to time it will shoot just fine. I took it to the range for a brief workout and found that standing, unsupported (no sling) I was able to group inside of ¾” at 11 yards so I would say this rifle is capable of killing tin cans all day! I’ll be donating this to the Gun Blogger Rendvous raffle, so the only way to get your hands on it is to buy raffle tickets. Better still, the proceeds from the raffle go to Project Valour IT, so regardless of how much you win, you’ll still go home knowing you’ve helped a good cause. So fill out your registration and make your travel plans. You need to get to Reno! I'll be stealing one of your photos for re-posting and linking back.